I experienced a strange little behavourial shift in myself recently. 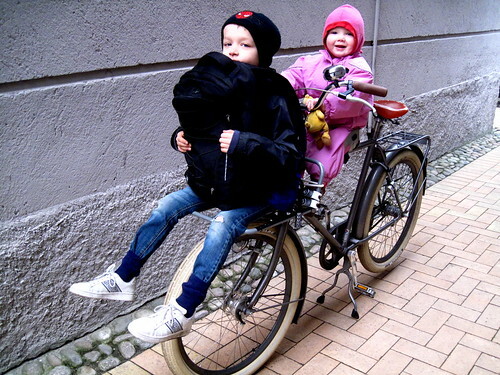 I use my two bicycles rather equally - the Velorbis and the Bullitt cargo bike. When not transporting kids, the Bullitt cargo bay is a respository for my bag. I just chuck it in, instead of having it slung around my shoulder. 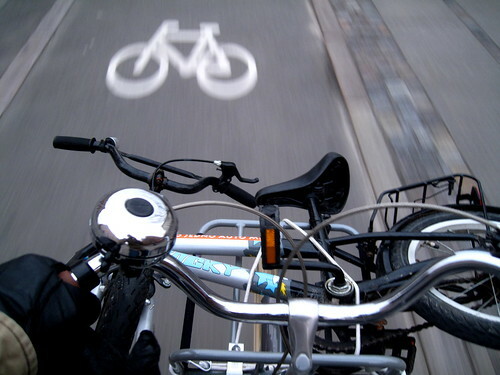 I discovered that I missed this ease-of-use when riding the upright Velorbis. I stuck the bag, Copenhagen-style, on the back rack under the rat trap. Which is what I've always done and, indeed, what most people without baskets do. Then I got a front rack put onto the Velorbis. These front racks have been a main feature for over a century, especially on Short Johns or delivery bikes/chimney sweep bikes or whatever you want to call them. Interestingly, they're experiencing a bit of a revival these day in Copenhagen. As soon as mine was on, I noticed that I was just slapping my bag onto the front rack and securing it with a bungee cord. Super quick and easy. Then I realised that the damned thing was much more practical than I had imagined. The other day I had to go pick up my boy at a friend's house. I just put his bike on the front rack and off I went. 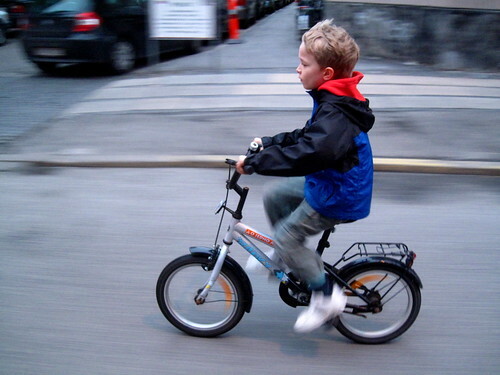 And here's Felix riding home on it, which he loves to do. We only have about 450 metres to the school and the daycare so we often just walk, but now the front rack is a perfect perch for Felix, while Queen Lulu gets to sit on the 'bulldog' seat on the crossbar. They both love it. I was actually telling Felix about how I saw lots of kids sitting on front racks in Amsterdam and he said, "Maybe if someone sees us, they'll think we're from Holland!" Poor kid doesn't realise that it wouldn't get us any street cred/dates/free beers, but the thought was nice. 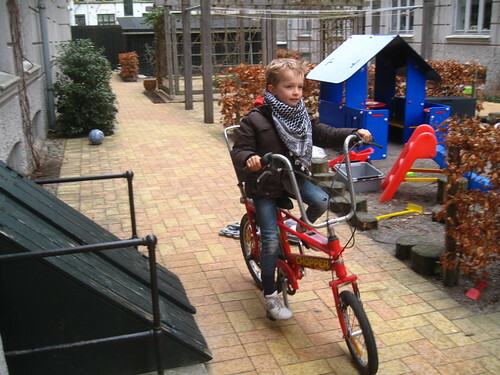 :-) He enjoys seeing the pictures of people riding bicycles in other countries that I bring home. I think it's important to show him the global diversity of bicycle culture, whether established or emerging. The bicycle he's on in the pervious picture, higher up, is getting a bit small for him, but he masters it like an Apache masters his horse. This bike, above, is waiting in the wings for him. A retro Raleigh chopper. He needs about three more centimetres before I unleash him on the bike lanes.